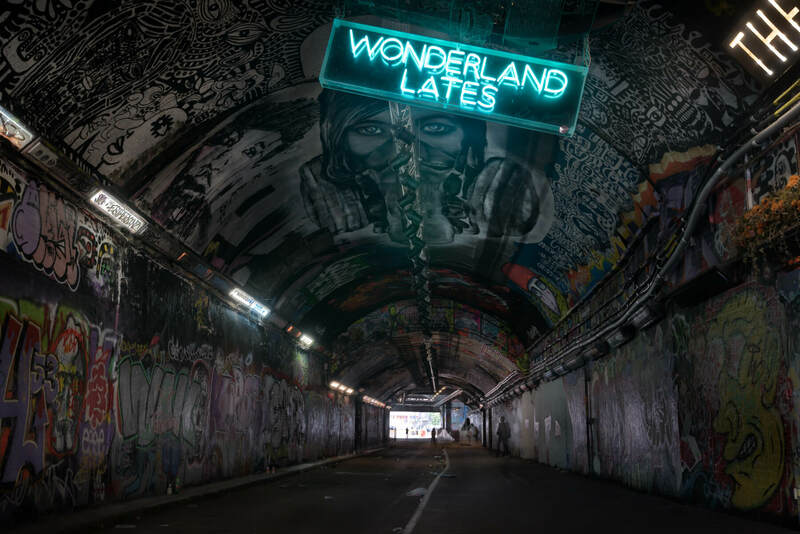 Leake street graffiti tunnel is an amazing place in London where graffiti artists can paint legally. The tunnel is very large and has a great selection of graffiti styles. This photo is created from nine bracketed shots. As most of you will know if you shoot in a dark tunnel the outside light will be incredibly bright, overexposed with no detail, if you expose for that light area the inside of the tunnel walls will be very dark, so a work round is to bracket the shots which gives you one normal exposure (see fig1 image) a +1 exposure, +2, +3, +4 and a -1, -2, -3 and -4. To stop the tunnel opening from being really bright I used the opening from the -4 exposure shot. A great thing about this location is that the walls will be constantly changing as artist paint new images month after month, it's on my list as a place to revisit.